The original Bay Area thrashers were defiantly confronting the elephant in metal’s room: with death metal upping the ante underground, and grunge dominating the mainstream, their genre of choice was on the way out. “That song was our response to the fact that every thrash band we knew were no longer thrash bands in interviews; they were all hiding from their past,” explains Exodus guitarist Gary Holt. Yet at the time, 1990 felt like a second Golden Age to the fans, with career-highlight releases from Megadeth, Anthrax, Slayer, Kreator, Annihilator, Forbidden and Vio-lence. Meanwhile, the Clash Of The Titans tour brought together Slayer, Megadeth, Testament and Suicidal Tendencies for a celebratory run in European arenas. In August, Metallica threw down their divisive but humongous Black album, catapulting them way beyond genre boundaries and smoothing the way for other maturing thrash pioneers to reassess their musical priorities. Kreator frontman Mille Petrozza was interviewed for a Metal Hammer thrash special in 1992, promoting Kreator’s sixth album, Renewal – a bold departure from their sound. “Either we come up with new ideas or the apocalypse is just around the corner,” the 24-year-old Mille stated. Today, Mille remembers feeling restricted by the confines of thrash after 10 years at the coalface. “We saw potential in experimenting and adding new influences,” Mille reasons. Even the biggest names at the top of their game were subject to corporate intrusion. 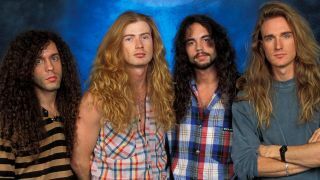 Megadeth were global metal superstars, but still the fat cats were trying to tell Dave Mustaine what to do. Metal Hammer had earlier reported that Force Of Habit “could be a lot less thrashy than before. It looks like the band are following Metallica’s way of writing songs… with a more simple build-up but with a lot more ‘groove’.” This idea of ‘groove’ hung around the morphing thrash scene in the 90s, reflecting the seismic importance of Texan hell-raisers Pantera. The 80s thrash revolution had changed them from poodle-permed glam wannabes into the 90s’ most radical metal success story, their music hitting unexpectedly hard. That body-buckling power-groove was also energising New Orleans rivetheads Exhorder, NYC crossover trio Prong, and Brazil’s thrash gods Sepultura; after submitting to death metal on 1991’s Arise, they assimilated urban grooves on 1993’s seminal Chaos AD. Meanwhile, Bay Area scene veteran Robb Flynn left Vio-lence to form Machine Head. Their zeitgeist-defining 1994 debut Burn My Eyes immediately caught the attention of thrash’s most revered pioneers, Slayer, who took the fledgling Oakland bruisers on a hot-ticket world tour. Even so, these were hard times for the innovators of 80s thrash. Death and black metal were thriving, and both took their cues from thrash’s innovations, but class acts like Death Angel, Holy Terror, Celtic Frost, Heathen, Possessed, Forbidden, Dark Angel, Watchtower, Holy Moses and even Exodus bit the dust – if only for a few years. There seemed two options for the surviving thrash generation: slow down, groove out, clean up and broaden the sound, or keep getting harder and more extreme. Testament excelled at both approaches. The Ritual, released in 1992, was a melodic, accessible bestseller – just what their major label Atlantic was hoping for. However, after losing virtuoso guitarist Alex Skolnick, the quintet brought in ex-Death/Obituary man James Murphy and dropped Low in ’94; Chuck Billy’s monstrous, newfound death growl over James’s downtuned fury came as a pant-soiling shock. Unsurprisingly, “the angry record”, as Chuck calls it, was their last for Atlantic. Three years later they released Demonic, featuring Dark Angel drum legend Gene Hoglan. Around this time, the Scandinavian black metal scene rediscovered its thrash roots. Tanked-up throwbacks such as Nifelheim, Aura Noir, Gehennah, Infernö, Bewitched, Desaster and Guillotine paid homage to the look and sound of thrash circa 1985, reaching a peak in 1998 with the uproarious debut by Swedish grave-robbers Witchery, Restless & Dead. That same year, Witchery guitarist Patrik Jensen was also behind the frantic crunch on The Haunted’s self-titled debut, another killer disc bringing back thrash fundamentals as the new millennium loomed. In 1999, there were comeback albums from reanimated genre pioneers Artillery, Suicidal Tendencies, Metal Church, Agent Steel and Stormtroopers Of Death, plus Sodom’s blistering Code Red. But it was surely Testament who fired the starting pistol for the imminent millennial thrash revival. Welcoming ex-Slayer drummer Dave Lombardo for 1999’s The Gathering, it was a magnificent reassertion of key thrash principles at the end of a hostile decade, accelerating the momentum of a revival that had been bubbling under for a while.